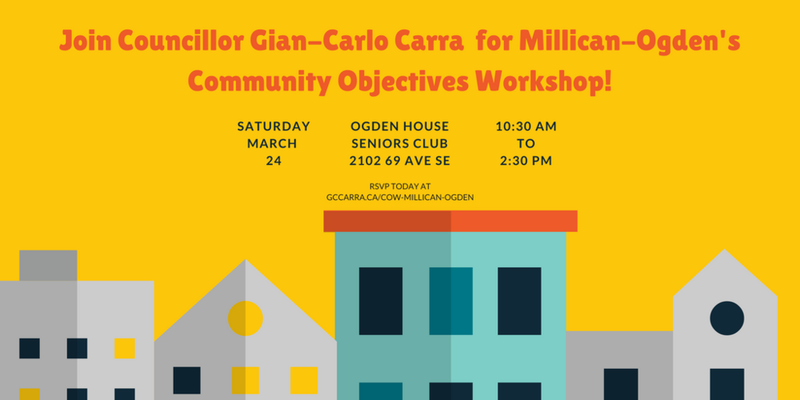 Join your Team Ward 9 in preparing the Strategic Plan for the community of Millican-Ogden-Lynnwood on March 24, 2018. Hello to all of my Millican-Ogden-Lynnwood neighbours! I believe that great neighbourhoods make a great city and to build great neighbourhoods, community stakeholders must work with their elected official to discuss the direction of their communities. In 2016, your Team Ward 9 ran a series of Community Objectives Workshops (lovingly known as COWs) in every one of our great neighbourhoods. From this work we were able to come together and develop a game plan on tackling important issues in each neighbourhood. We recorded all the data collected (which can be found in our Millican-Ogden-Lynnwood Raw Data Report) and distilled this information into the Ward 9 Strategic Report 2013-2017. I am very proud to announce that I will be continuing to host the Ward 9 Community Objectives Workshops (lovingly known as COWs) in all Ward 9 neighbourhoods in 2018 and I would like to invite all our Ward 9 neighbours in Millican-Ogden-Lynnwood to join us for a follow up session to our first COW. What are the goals of the 2018 COWs? Prepare the 2017-2021 Ward 9 Strategic Report for Ward 9 residents that outlines the strategic plan and goals, and how they will be achieved. These workshops continue to be a huge success and the results will help to direct and guide the work that we do on your behalf. Please note: You did NOT have to attend the 2016 COW to be able to participate in our 2018 series and all are welcome, although space IS limited. I hope you will join me in building Great Neighbourhoods.